Herbs are plants that contain ingredients with active therapeutic properties. These active ingredients may be present in the whole plant or only in a specific part. Other parts of the same plant, or other plants in the same genus, may have no activity or may in fact be toxic. "An herb may be used in various forms, including teas, granular extracts (Chinese medicine), fresh herbs, dried herbs, oils or tinctures." An herb may be used in various forms, including teas, granular extracts (Chinese medicine), fresh herbs, dried herbs, oils or tinctures. It may be commercially available as a loose herb, capsule, tablet, liquid extract, lotion or cream. Herbal therapy is the use of herbs, either as single products or in combination with other herbs, for medicinal purposes. What is the history of herbal therapy in veterinary medicine? Herbal therapy has been used for thousands of years in many human cultures. Over centuries and even millennia, a tremendous amount of clinical experience has been obtained by these cultures regarding which herbs work well for which conditions, and how they are best administered. It has been estimated that even today 75 percent of the world's population relies upon herbal medicine for basic health care. Early civilizations placed a great deal of emphasis on the health of the horses and cattle that were so integral to their lives. As a result, the history of veterinary herbal treatment parallels its history in human therapy. In the late eighteenth century, advances in science enabled chemists to isolate and purify active ingredients in herbs. Further advances led to the ability to manufacture synthetic pharmaceuticals. At this point, herbal therapy diverged from mainstream medicine, since conventional medical researchers believed that it was safer and more effective to administer specific doses of the pure active chemical, whether it was synthetic or derived from plants. "Advocates of herbal therapy maintain that whole herbs or their extracts were more efficacious..."
Advocates of herbal therapy maintain that whole herbs or their extracts were more efficacious and that the natural product contains other ingredients that act synergistically with the active principle, increasing the efficacy of the medicine. On which species of animals is herbal therapy practiced regularly? It was not until the late nineteenth century that veterinary medicine turned from herbal treatments to conventional pharmaceuticals. While significant research support exists for the use of herbs in veterinary medicine, most treatment protocols used in dogs, cats, horses and ruminants are based solely on clinical experience or research data that has been obtained from work with laboratory animals and humans. Slowly there is an emerging consensus among veterinarians regarding which approaches work best for various diseases, leading to protocols ripe for eventual confirmation of their efficacy by clinical research. Animal treatments are frequently inspired by human herbal medicine, but veterinary expertise is required to select the appropriate formula and to address differences in metabolism between animals and humans, and between the various animal species. Who practices veterinary herbal therapy and do I need a referral? Herbal treatment must only be administered after an accurate diagnosis has been made. Because of the differences in physiology between animal species and humans, and the potential for harm if herbs are administered inappropriately, only a properly trained veterinarian should prescribe herbal treatments. "...the practice of veterinary herbalism to be the practice of veterinary medicine." The American Veterinary Medical Association and the Canadian Veterinary Medical Association both consider the practice of veterinary herbalism to be the practice of veterinary medicine. In accordance with regulations in the local jurisdiction, herbal treatment must only be prescribed by a licensed veterinarian, or under the direct supervision of a veterinarian. As veterinary herbal treatment grows as a specialty, there are increasing numbers of veterinarians in private practice who have obtained the necessary training and experience in herbal medicine. In many cases, referral is not necessary, but should be considered for the herbal management of very dangerous, refractory, or delicate conditions. What conditions are most often treated with herbal therapy? Herbal approaches have been developed for the management of almost all conditions that currently challenge conventional veterinary medicine, including epilepsy, chronic kidney failure, chronic lameness, hormonal disorders, behavioral disorders, allergic skin disease, liver failure, and inflammatory bowel disease. Other herbs may simply support the normal function of healthy organs by acting as "tonics". How can my pet benefit from herbal therapy? Herbalists hold the view that their treatments, using whole plants or their extracts, produce improved outcomes and fewer side effects than many pharmaceutical products. Just a few general actions of plants confirmed by clinical and laboratory research include the support of normal function of the liver, kidneys, heart, and immune system; reduced inflammation and improved blood flow through damaged tissues; normalization of smooth muscle contraction; promotion of the differentiation, aging and death of tumor cells, and elimination of pain. In many cases, herbal medicine can eliminate the need for chronic medications. The components of herbal formulas may act synergistically to give greater positive effects than would be possible when used individually. Such synergistic interactions between herb constituents have been repeatedly demonstrated in laboratory research on both single herbs and herbal formulas. How successful is herbal therapy? 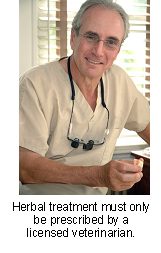 "Herbal therapy should never be administered without a proper veterinary diagnosis." Herbal therapy should never be administered without a proper veterinary diagnosis. The success of herbal treatment will vary according to the age of the patient, prior treatment history and diagnosis. Since the science of herbology hasn't caught up with herbal practice at this time, even scientifically trained practitioners must rely upon clinical experience and traditional knowledge when deciding on an herbal prescription. When high quality herbs from reputable sources are used, dosages are more consistent and the outcomes are more predictable. How safe is herbal therapy? Particularly when herbal therapy is being used to treat serious disease, ongoing monitoring of the patient's symptoms and any laboratory abnormalities is required. If the wrong herb or the incorrect dosage is given, the patient's condition may worsen. In the hands of a knowledgeable veterinary herbalist, adverse reactions are uncommon and usually short-lived, but may still occur. Caution should be used when treating pregnant animals, if other therapies are being used, or if the animal is very ill.
"...herbs are not regulated with respect to quality control nor are there any requirements for demonstrating efficacy and safety." At the present time in many countries, herbs are not regulated with respect to quality control nor are there any requirements for demonstrating efficacy and safety. Quality of herbs will vary according to many factors, including growing conditions, age at harvest, time of harvest, handling after harvesting, and storage. Many plants will absorb and concentrate environmental contaminants within their parts, while others may become contaminated or adulterated during harvesting or processing. This has led to a preference among veterinary herbalists for use of products certified as organic. The shelf life of herbs varies from within 6 months of harvest for bulk herbs to about three years for granular extracts of Chinese herbs, and up to five years for tinctures. Reputable products should have an expiry date printed on the label. What is the cost of herbal therapy? Comprehensive herbal treatment involves a thorough history taking and physical examination, followed by a patient assessment and formulation of a treatment plan. It rarely involves a single visit, and costs will vary according to the specific condition being treated, the herbs required and the response of the patient. The fees associated with herbal treatment are set by the individual practitioner, and will often reflect the skill, experience and training of the practitioner. In general, treatment using veterinary herbal therapy is not prohibitively expensive. Over the long term, it often proves less expensive than conventional medicine. Can herbal therapy be combined with traditional veterinary medicine? 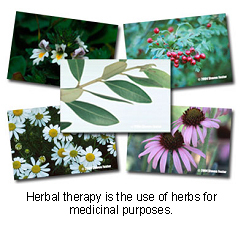 Herbal therapy can be combined with other forms of treatment if the appropriate precautions are taken. Some herbs are very potent, and caution must be used when combining them with other treatments such as drugs, homeopathic remedies, and acupuncture, since these treatments can either potentiate or negate the effects of each other. As a complete and well-developed system of medicine, herbal therapy is effective as the sole form of treatment for most conditions except those requiring surgery, and is used that way by skilled practitioners. Trained veterinary herbalists have the knowledge and skill to understand the interactions between different forms of treatment and to interpret the patient's response to therapy. If your pet is receiving herbal treatment from a practitioner other than your regular veterinarian, it is imperative that both individuals are kept updated about the ongoing treatment in order to provide optimal care to your pet. "Herbal treatment of serious disease in animals without veterinary training is not advised and frequently ineffective." Herbal treatment of serious disease in animals without veterinary training is not advised and frequently ineffective. 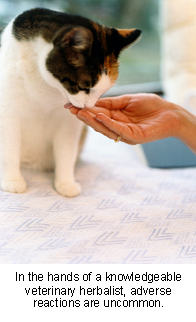 How can I find out more information about veterinary herbal therapy? The most efficient way to find current reference materials, links, and referral lists is to consult the Alternative Veterinary Medicine website at www.altvetmed.org, or the Veterinary Botanical Medical Association at www.vbma.org. General information about herbs and herbal treatment issues can also be found at www.ars-grin.gov/duke/, www.herbmed.org and www.consumerlab.com.